This article explains the Stages of Grief and Loss, by Elisabeth Kübler-Ross in a practical way. 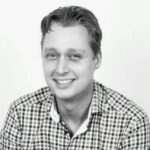 After reading you will understand the basics of this powerful psychological and change management tool. How does someone cope with a traumatic and distressing experience? To answer this question, the Swiss psychiatrist Elisabeth Kübler-Ross developed a 5 Stages of Grief and Loss model that shows how people deal with traumatic or distressing experiences at work or in private life. Elisabeth Kübler-Ross discovered that terminally ill people experience a number of stages during the progress of their disease. Her 5 Stages of Grief model provides an insight into how people cope with drastic changes or loss. As such a process is also called coping with bereavement, these five Stages of Grief is also known as the Elisabeth Kübler-Ross bereavement cycle. Initially, people are shocked when they receive bad news. This general defence mechanism buffers the initial shock and gives the person the chance to come to their senses. Subsequently, they will gradually recover from this shock. It is important that they can express their feelings for example by talking to a confidential counsellor. At the end of this stage, the person will start searching for facts, the truth of for someone to blame. When someone can no longer deny what is happening, feelings of anger, irritation, jealously and resentment arise. Anger and powerlessness are especially directed at their environment. They put the blame on other people, colleagues, employees and counsellors. Sometimes the anger is directed at the bearer of the bad news. At this stage, people are trying to get away from the dreadful truth in many different ways. This stage of the Stages of Grief and Loss involves bargaining. By setting themselves goals, the blow of bad news is softened. In a work environment they will find it very difficult to negotiate working agreements or make promises. If they are threatened with (impending) dismissal, they will go to court as a form of counter attack. During the fourth stage, the truth is finally sinking and the person involved feels helpless and misunderstood. As a result, they will be withdrawn and avoid communications. They do not answer the phone or respond to e-mails. There is a chance that they could take refuge in alcohol and drugs such as painkillers, tranquillizers and sleep-inducing drugs. When the person involved becomes aware of the fact that there is no more hope, they can accept the bad news. They can recover from the previous stages and accept their grief. After some time they will feel like taking up activities again and they will start making plans again. 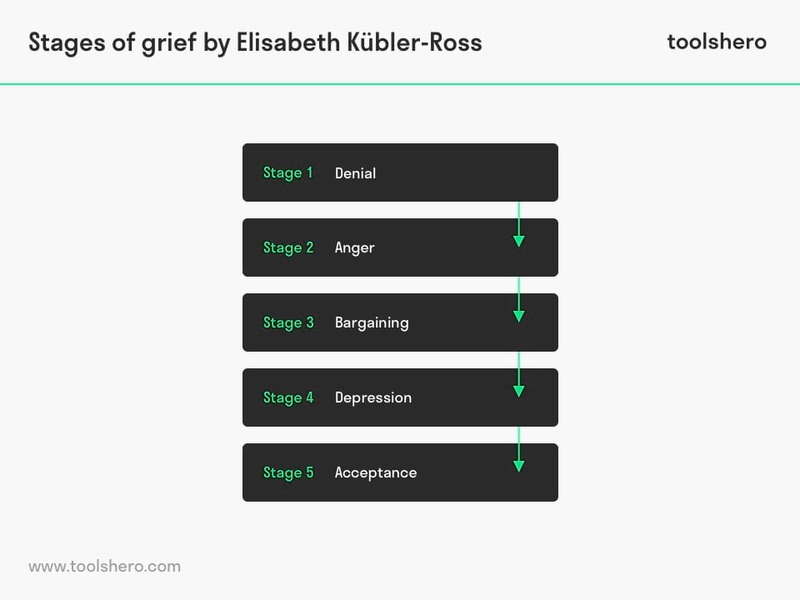 Elisabeth Kübler-Ross ’s Stages of Grief theory was primarily used for coping with grief but is still used today for understanding change reaction in large organizational changes. The ultimate goal is acceptance, in which a non-directive attitude (supportive) plays an important role. In addition, the main conditions are being empathetic towards the person in question and accepting them unconditionally with pure authenticity. By listening to someone’s story, the other party will act as a sounding board. People will go through the above mentioned stages at different paces. Some people will get stuck in a certain stage, whereas other people go through several Stages of Grief simultaneously or in a different order. Some Stages of Grief may overlap one another or people may skip a number of stages altogether. What do you think? Do you recognize Stages of Grief and the practical explanation or do you have more suggestions? What are your tips when you work with the 5 Stages of Grief and Loss model? How do you deal with losses and what are the tips that you can share to help others? Barone, J. E., & Ivy, M. E. (2004). Resident work hours: the five stages of grief. Academic Medicine, 79(5), 379-380. Kübler-Ross, E. & Kessler, D. (2014). On grief and grieving: Finding the meaning of grief through the five stages of loss. Simon and Schuster. Kübler-Ross, E. (1970). The care of the dying-whose job is it?. The International Journal of Psychiatry in Medicine, 1(2), 103-107. This is great, except that this was based on her work with the dying. Yes, the living go through much of the same, but there are the life-long aspects to grief that her work never covered. Thank you for your feedback, Jim. We’ve updated the article and hopefully clarifies your question.